The gold hilt consists of a pommel made of two lions’ heads back to back, the one looking outwards the other inwards, with a collar charged with six stars of six points, and a pair of quillons formed by the wings of a naturalistic eagle displayed and holding in its talons the thunderbolt of Zeus. The slightly barrel-shaped grip of oval section is made of lapis lazuli. The straight, double-edged blade, which is of mechanically-watered steel of flattened lenticular section, with a pair of wide contiguous fullers flanking the central line start from the hilt, and an obtuse tip with concave edges. Incised and overlaid with gold sheet on a matted and blackened ground, on each face with candelabra ornament, including a military trophy and laurel branches entwined, a stylized sunburst within a circle, all on a lyre-like base. 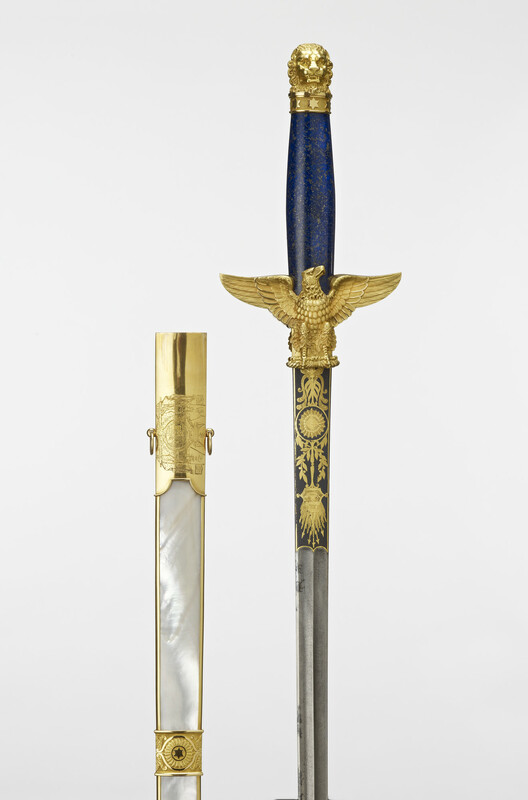 The scabbard has a wooden lining overlaid with plaques of mother-of-pearl framed in gold, and has four gold mounts. The locket is engraved on the front with the arms of Godoy, and on the reverse with 'Manufacre Impériale, Versailles, Entreprise Boutet'. It has a loose-ring on each side for the baldrick. On the reverse are the following marks: a man’s head viewed from the front between the figures 88, all in an oval punch; a cockerel viewed in profile from his right with the number 3 over his back, all in an oval punch, its longer axis horizontal; a pistol fesswise with the letter N above and an illegible letter below, all in a diamond-shaped punch with its longer axis vertical. (The marks are the poinçon de garantie for gold and silver in the Department of Seine Inférieure, for the period 1798-1809, the third standard mark (poinçon de titre) for gold in the Departments for the same period; and what is presumably the maker’s mark of Nicholas-Noël Boutet). The two transverse bands are cast and chased with pateræ each with a star of six points at its centre framed by a pair of acanthus scrolls. The chape, which has a lobate end flattened in the plane of the blade and a prominent terminal button, is cast and chased in the form of a bundle of spears tied with fillets. The same three marks appear on the side of the chape where it can be seen that the second letter in the third punch is B. The leather baldrick is covered in crimson velvet (now very faded), and the outer face completely overlaid with seventeen rectangular frames of gold within which are various cast and chiselled devices, also of gold, enamelled with translucent enamel in basse taille technique. Alternate frames are pierced with laurel branches framing elaborate symbolic trophies. The remaining frames are each divided into three transverse compartments each containing one or more devices. The lunette-shaped terminal mounts, which are of gold enamelled deep blue, are each set with a gold eagle displayed on a trophy of flags cast and chiselled in relief. Each supports a gold swivel in a bell-shaped mount, chiselled with acanthus tips, for the rings of the scabbard. The first plaque frames a blue bomb with three crimson flames; the second plaque frames four dark-blue stars of five points, two Hercules clubs in a saltire and a classical helmet in chief, all within a laurel wreath picked out in green and a Roman sword picked out in pale blue; the third plaque frames a trophy symbolic of Geography, Geometry and Music, picked out in green and blue; the fourth plaque frames a laurel branch and an oak branch in saltire picked out in green and a lion’s pelt and clubs in saltire; the fifth plaque frames a trophy of classical arms picked out in grey; the sixth plaque frames, on either side, three small shields azure each charged with an Imperial Eagle, two Hercules clubs in a saltire and a classical helmet in chief, all within a laurel wreath picked out in green; the seventh plaque frames a trophy symbolic of Physics and Chemistry; the eighth plaque frames two Roman swords in a saltire, two laurel wreaths interlinked and four dark-blue stars of five points; the ninth plaque frames a blue bomb with three crimson flames; the tenth plaque frames two Roman swords in a saltire, two laurel wreaths interlinked and four dark-blue stars of five points; the eleventh plaque frames a trophy symbolic of Agriculture; the twelfth plaque frames, on either side, three small shields azure each charged with an Imperial Eagle, two Hercules clubs in a saltire and a classical helmet in chief, all within a laurel wreath picked out in green; the thirteenth plaque frames a trophy of classical arms picked out in grey; the fourteenth plaque frames, on either side, a laurel branch and an oak branch in a saltire picked out in green and a lion’s pelt and clubs in a saltire; the fifteenth plaque frames a trophy symbolic of the Arts of Painting, Sculpture and Architecture; the sixteenth plaque frames four dark-blue stars of five points, two Hercules clubs in a saltire and a classical helmet in chief, all within a laurel wreath picked out in green and a Roman sword picked out in pale blue; the seventeenth plaque frames a blue bomb with three crimson flames.